Brussels sprouts have gotten a bad rep and that makes me cranky. They are, without a doubt, my favorite vegetable. I roast the dickens out of them with whatever other veggies I have around, doused in olive oil and salt. I saute them with bacon or in duck fat. I even nuke frozen ones and toss them with ghee and spices when I’m lazy and needing something cleansing. So I’m serious, here, people. For Christmas my mother gave me a Cuisinart food processor, the kind that’s compact and also a blender – which in itself is a blessing for small NYC apartments that are already overstuffed with cooking equipment. The addition of a crazy-awesome slicer into my kitchen has made me a little slicing-crazy, so the other night I decided it was time for the tiny organic Brussels sprouts I had picked up after my restorative yoga class (om, delicious) to face the wrath of my new friend. 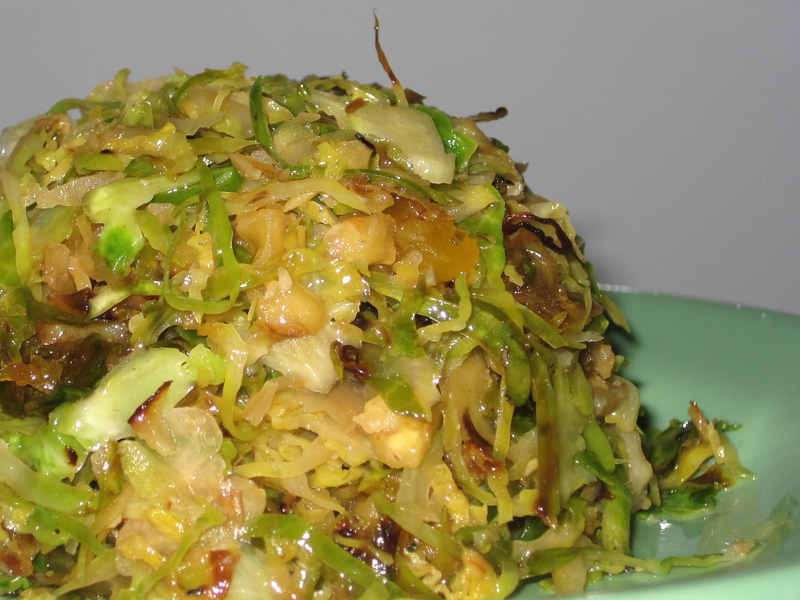 The convenient thing about shredding sprouts is that they cook relatively faster and you can get a nice even coating of flavor. They also crisp better, and while I love the texture of a crispy outside and soft inside of a sprout cooked whole, this is a delectable contrast. Now I kept this batch rather middling on the whole savory-vs-sweet line. I didn’t want too much maple flavor – that I reserve for Thanksgiving when all hands are on deck. This was meant to be a healthy side that would taste great with my soup that night and my eggs the next morning. And I’m trying to cut back on my salt intake – I usually pour that glorious stuff with abandon, as I have really low blood pressure and it helps curb induced headaches. But I’m definitely not getting any younger and will take anything that will help me feel less puffy, so salt is simmering in quantity in my kitchen. The result? My favorite veggie just topped itself as my “ultimate, never-to-be-beaten, will-write-love-sonnets-to-them” veggie. For these Brussels sprouts I would become a poet. Oh, and in writing this entry I went back to my fridge and proceeded to heat and eat the last of the bunch – though I ate my second portion with lunch not an hour before. Well played, watering mouth, well played. Add to pan and stir thoroughly to coat with oil, than cook for about 10 minutes, stirring occasionally, until the sprouts soften. Turn heat up to high and quickly stir until sprouts are browned. Turn heat to low and add apricots, nuts and then maple syrup, and stir thoroughly to coat. Cook for five to ten minutes more on low until at desired softness. Adjust salt and add pepper to taste.